The Neb Stone looking to the east. The Badger Stone is to the top right, out of picture. This landmark stone can be seen from a great distance across the moor standing above a wall that runs south, up from Intake Beck, past Silver Wells Cottage before bearing to the west and continuing to Silver Wells itself. For such a prominent rock it has only a few possible cup marks, as do 2 of the large rocks next to it that make up part of the wall. 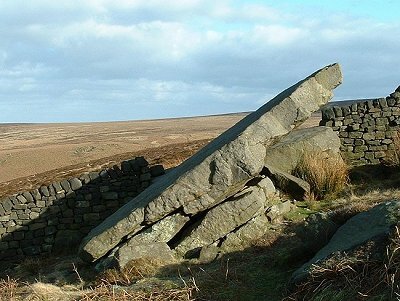 It is possible that as the large flat side of this stone faces to the north across Ilkley and does not face the sun as other sites such as the Badger Stone does, that it was not deemed suitable for use as a carving surface by the inhabitants of the moor. Some interesting sightlines include the Badger Stone, (east-south-east), Willy Hall's Wood (east) and Weary Hill (northeast).. Probably the easiest way to get to the Neb Stone is to walk up Keighley Road until a track leads off to the west and almost directly to the stone. 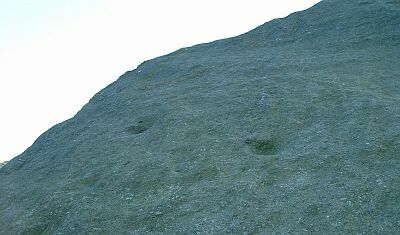 Two possible cups on the face of the Neb Stone.